Last month when dealing with my monthly attack of insomnia, I got the urge to watch some old school Voltron. And I haven’t stopped since. I watched all the 80s episodes on Hulu. I tracked down the original Beast King GoLion Japanese show (not appropriate for children at all, btw) on YouTube and Crunchyroll . I even watched the 2011 Nick Toons reboot, which I like. Don’t shoot me. My childhood obsession was back. And that’s how I ended up searching for this Omnibus. I started out loving this – the characters all had more personality. Backstories will do that. 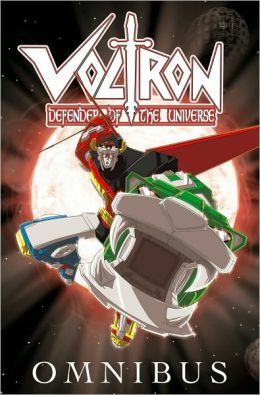 I adored the more mystical origins of Voltron, which are more inline with GoLion and what the Nick Toons reboot was starting to explore. I love how the Lions chose their pilots and connected with them telepathically. Luckily, it wasn’t nearly as sanitized as the 80s cartoon either. No cheesy speeches from Keith. No Nanny at all, thank God. And we get an Allura who’s tons more forthright, not letting Coran rule her. She is the princess of Arus after all. What kills it is the printing errors. Pages out of order, which throws off the reader in some of the more climatic parts of the story. Towards the end of the 12 issues included in the omnibus, the artwork gets sloppy and the characters start looking completely different. The mythological aspects seem to get replaced by the more robotic, scientific ones. It just felt lazy. Yes I know, the series was cancelled because of sales, but that didn’t mean the fans who did buy these issues had to suffer. If this is all we’re getting, since movie plans don’t seem to be panning out, they could’ve done us a solid. I’m also really tired of every incarnation of Voltron playing around with Keith and Allura, rather than just going for it. Are there other comics that actually do? Maybe I’ll pick up those.